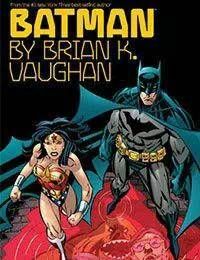 Critically acclaimed, award-winning writer Brian K. Vaughans (SAGA, EX MACHINA, Y: THE LAST MAN) work on the Dark Knight is now collected here in its entirety in BATMAN BY BRIAN K. VAUGHAN.In the first of these tales of the DCU, Bruce Wayne adopts the guise of Matches Malone--the seedy identity he uses to infiltrate the Gotham underworld. But when Matches is shot, its up to Batman to determine what really happened...and how Scarface is involved! Plus, in other stories, Batman takes on the Mad Hatter, and Wonder Woman and Donna Troy square off against Clayface! This new graphic novel edition collects BATMAN #588-590, DETECTIVE COMICS #787, WONDER WOMAN #160-161 and BATMAN: GOTHAM CITY SECRET FILES #1!